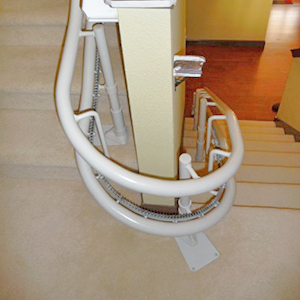 Reconditioned curved Stairlifts such as the Eco curve are both cost effective and good for the environment. By re-using and remanufacturing the existing equipment, there is less impact on the environment and a good quality product gets a new lease of life and changes somebody else's. 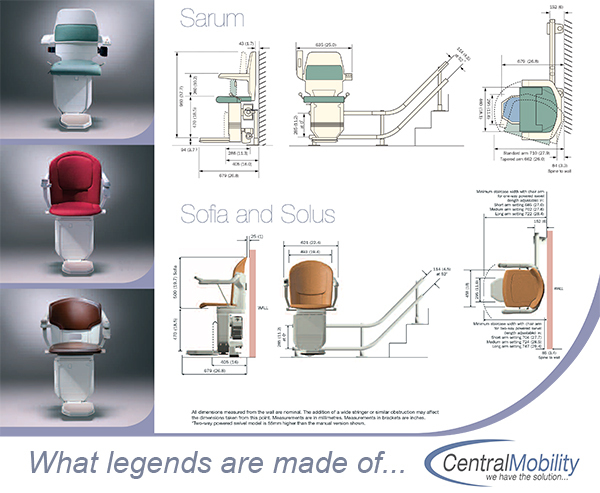 The ECO Curve is a fully reconditioned curved stairlift. Everything is fully refurbished and tested. This makes the ECO Curve environmentally friendly, as well as delivering significant savings over a new stairlift. 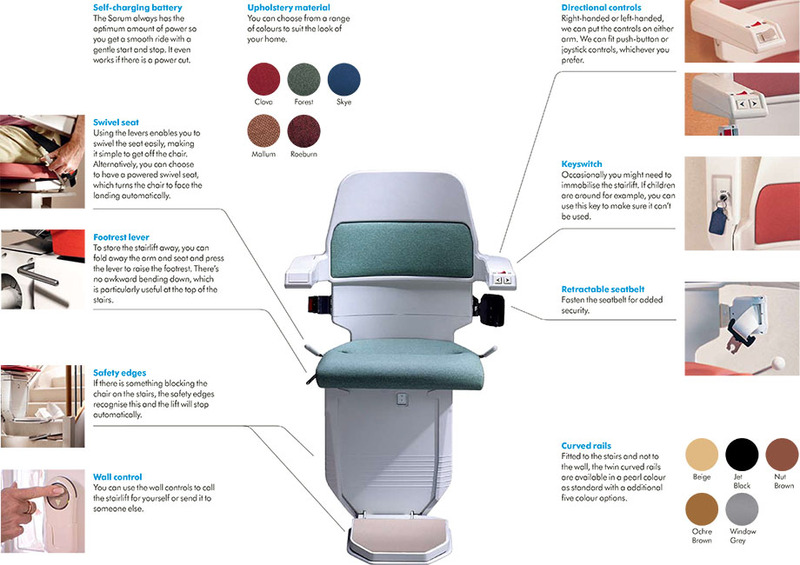 The Eco Curve reconditioned curved stairlift has over 30 different tests carried out prior to installation on all used stair lift carriages, ensuring that the product reaches not only our own high standards but also the standards set by the industry. These tests include both mechanical and electrical and are always carried out by a qualified technician. Eco Curve reconditioned curved stairlifts are all supplied with a new, hand-built rail, designed to fit the new purchaser’s home perfectly. All 'ECO' reconditioned curved stairlifts have the rail configured by computer aided design (CAD). This ensures a perfect fit with flowing bends which eliminate any bumps or jolts in the rail joints. The rail is then powder coated in a hard wearing coat of industrial paint ensuring it has a long and durable life span. Just about any bend is possible including internal and external radius bends. It can also double back on itself with a 180° bend and extra charging points can be added to allow the lift to be positioned in a more convenient place. 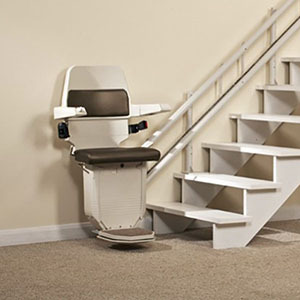 With its large comfortable seat with extra padding, the reconditioned curved stairlift is a pleasure to use. The luxurious seating design offers support to the user with sturdy arm rests capable of supporting someones weight whilst getting on or off the lift. Fitted with a robust control paddle, the 'ECO' is easy to use. A convenient on / off switch isolates the lift when required and a swivel seat lever is located within easy reach on the side of the seat. When you arrive at the top of your stairs the 'Eco' reconditioned curved Stairlift has an easy to use swivel seat. This is done by simply operating the large lever on the side of the seat. 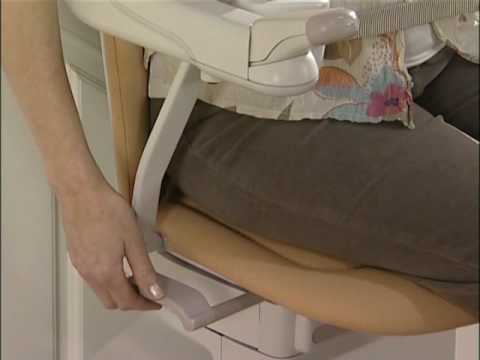 Once the seat has turned round it conveniently locks into position so that you can alight safely and securely. There is also a manual footrest lever next to it which makes it easier to get on and off without having to bend down to raise or lower it. Supplied with two remote controls as standard, the 'Eco' reconditioned curved Stairlift can be operated by multiple users when required. Located in neat holsters that attach to the newel posts or nearby wall, the remote controls are simple to use with a great range, long enough to reach either end of the stairs. 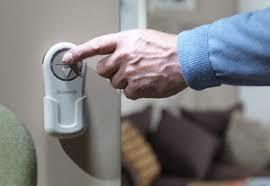 The remotes are battery operated which should be changed on a yearly basis to be safe.